The Archive Print Sale will be happening at 12pm PST today at Static Medium's shop site. There is a little over 120 prints. prices range from $120~$500. Please keep in mind that because there is a limited amount available, things might get a bit competitive, and there may be hiccups on the website server. So please bare with us and we apologize in advance if you are unable to purchase one. We will be sure to have more prints available in the near future. Once you are able to click into shopping cart, you have 10 mins to complete the order. If the order does not go though, that print will be available on the shop for someone else. Will keep you posted on my Facebook page. It's time for an archive print sale! These are from past sold out limited print editions. Most are AP's (artist proofs) and a few we've kept aside from the original edition. Saturday, October 15th at 12pm PST on @ Static Medium's website. The prices are marked up from the original price according to rarity/worth, and to try to avoid flippers from grabbing and reselling them. There will be framing options, which we've chosen to compliment the image. We've chosen either a black decorative moulding with a gold inner trim, or a light ivory moulding, depending on the print. Both have a bit of a dusty matte antique texture/finish. Conservationally framed with UV-coated acrylic. 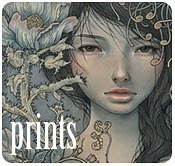 Acid-free backing and spacers are included to allow the print to breath. Scroll below to see the frames. This is our first time conducting this kind of sale, so it's worth checking my blog and facebook page for updates on the day of the sale. click HERE to see close-up of frames.